NOTE: studio kits come with rectangular tanks. 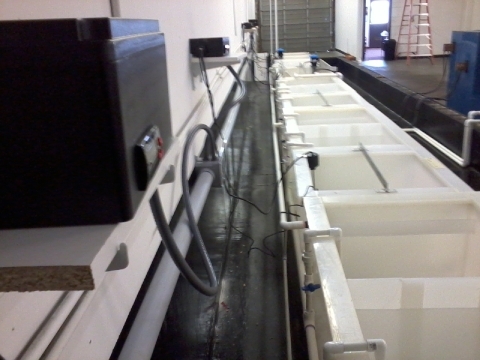 We find that rectangular tanks are much more versatile than a cylindrical tank of the same size. Look at pictures of any plating shop, you will find that almost ALL of the tanks in this industry are rectangular. 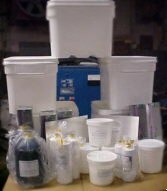 NOTE: Kits come with chemicals, tanks, heaters w/ thermostat, tank lids, cathodes. 2.3 gallon kit $399 Tank size - 9"x 7.5"x 9.5"
5 gallon kit $509 Tank - 11"x 8.75" x 14.5"
6 gallon kit $599 Tank - 12"x 11" x13.5"
10 gallon kit $935 Tank - 15" x 12" x12.5"
15 gallon kit $1239 Tank - 15" x 12.5" x18.75"
2.3 gallon kit $649 Tank size - 9"x 7.5"x 9.5"
5 gallon kit $885 Tank - 11"x 8.75" x 14.5"
6 gallon kit $990 Tank - 12"x 11" x13.5"
10 gallon kit $1350 Tank - 15" x 12" x12.5"
15 gallon kit $1695 Tank - 15" x 12.5" x18.75"
Commercial Users, available are "C" and Hybrid systems which are for commercial use only and come with commercial grade chemicals, commercial bussing & cathodes, and commercial equipment for critical stations. MIL-C requires "C" or Hybrid option. Home | Specialty Anodizing | Anodizing Main Page | Commercial © Copyright 2005 Plastic Plating Co.